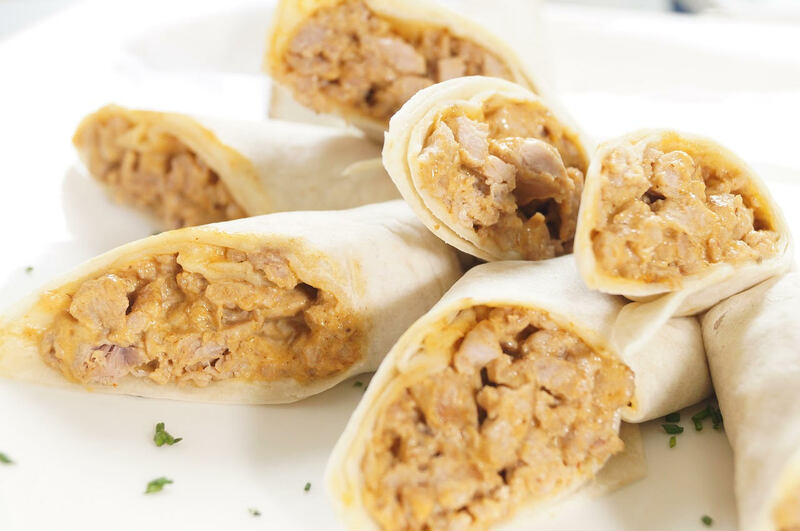 Thanksgiving has come and gone, but this recipe involving turkey and taquitos is good for just about any day of the week. Let’s begin. To prepare the sauce, use a small bowl to thoroughly combine the sauce and pistachios. Use a drizzling of water and continue to mix ingredients until you’ve achieved the consistency, Put the sauce aside for now. For the taquitos, begin by placing the shredded turkey in a bowl and then put aside for the time being. Grab a large skillet, turn up the heat to medium, and then melt a teaspoon of butter before adding the cumin, onions, salt, and celery. Saute for about four minutes or until the onions become translucent. Add another pair of tablespoons of butter, blue cheese, a tablespoon and a half of hot sauce, and cream cheese into a large skillet. Frequently stir the ingredients, making sure they are simmering over medium heat or until the cheese begins to melt. Grab the turkey you put aside and place it in the skillet with the cheese. Stir everything until thoroughly combined, take it off of the heat, and set it aside. Use a deep skillet to heat the oil until the temperature reaches 350 degrees. Fry the tortillas one by one for about seven seconds or so, making sure to flip them over to fry the other side for another four seconds. Drain the tortillas on a paper towel. Use either a dinner plate or chopping board to lay down a tortilla. Add a tablespoon and a half of the turkey mix in the tortilla center and then tightly roll it up so that it almost looks like a cigar. Use a toothpick to secure the ends. Once the tortillas are rolled up, deep fry them in pairs until they’re crispy and brown. After removing the taquitos and letting them drain, take out the toothpicks. This update or recipe is provided by tortilla company Easy Foods Incorporated. Our wholesale tortillasproducts include corn tortillas, flour tortillas, tortilla chips, and wraps. For more information on our services or brands like Tacomex and Vedgee or private label tortillas, please call 305-599-0357. Our business hours are 9 am to 5 pm Monday through Friday Eastern time and we are closed on weekends.